There needs to be informative, transparent and accountable communications throughout the MMIWG Inquiry. Contact your PSAC regional office if you would like more information on the Red Dress Pins. Jaime Black, a Métis artist, launched The REDress Project in 2014. The installation art project involved collecting and hanging 600 red dresses symbolizing the hundreds of Indigenous women and girls whose lives were stolen. 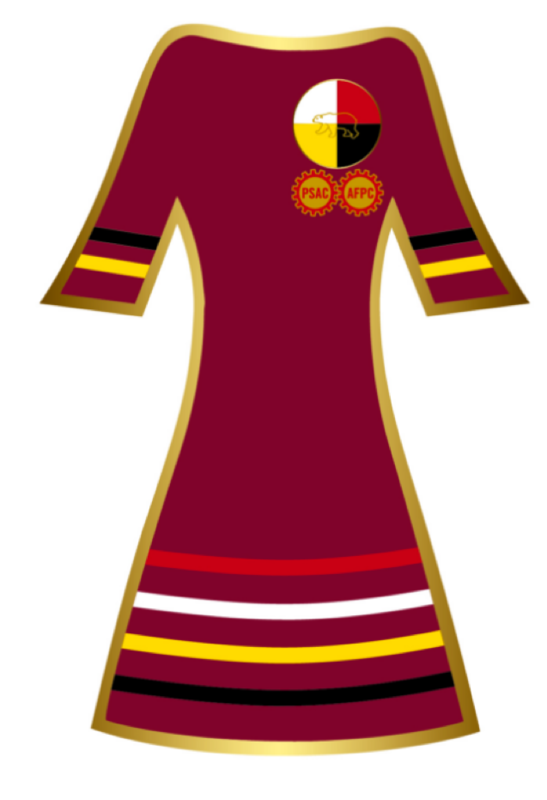 PSAC’s National Indigenous People’s Circle and National Human Rights Council Indigenous Working Group have partnered with Jaime Black to develop the Red Dress Pin in solidarity with all the Indigenous women who have been a victim or survivor of violence. Indigenous women and girls in Canada are disproportionately affected by violence and are over-represented in the rate of women that are murdered and go missing. The rate of homicide of Indigenous women is five times higher than non-Indigenous women. The Native Women’s Association of Canada (NWAC) began drawing attention to the issue of violence against Indigenous women in 2005. They assembled a database on 582 missing and murdered women and girls. In 2015, the RCMP reported that 1,815 Indigenous women were murdered between 1980 and 2014. In response to numerous calls for action from organizations such as NWAC and the Canadian Feminist Alliance for International Action (FAFIA), the Government of Canada launched an entirely independent National Inquiry into Missing and Murdered Indigenous Women and Girls (MMIWG) in September 2016.